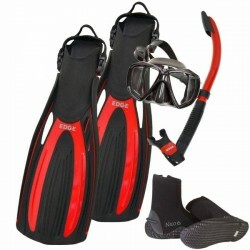 Edge Flex Scuba Mask Snorkel Fins Package Plus! ** You select one from each of our drop down options to build your own kit! Plus we added a couple of options to choose from to really make a splash! The Edge Duo is a low-profile low volume two window mask that features the newly developed and revolutionary Technology delivering superior fit, comfort and performance. The Duo is one of the first next generation Edge masks offering this innovative new technology combined with superior design, build quality, materials and frame construction. This mask is offered in Black/Black and Clear/Black. The Edge Aero Snorkel has a splash-proof dry guard that virtually eliminates water intake through the top of theTube. If any water enters the snorkel tube it can easily be blown out with the Easy Purge Systems One-Way Valve at the bottom of the snorkel tube. Lightweight, high performance dual-composite fin blade for ultimate comfort, efficiency and performance. Featuring full-length power rails and a central flex channel. The Flex Open Heel Fin blade's Flexible Thrust Channel directs water off the tip of the blade for improved power and efficiency. Open heel foot pocket is held comfortable and secure with our unique, highly stretchable silicone heel strap.